Sonic the Hedgehog 51 is the fifty-first issue of the Sonic the Hedgehog comic. It begins the events after the death and downfall of Robotnik's reign. This comic features one story: "Reality Bytes". It is the night of Robotnik's downfall. With the evil dictator finally defeated, Knothole Village has been decked out with decorations and the citizens celebrate in the meeting area, except the main Freedom Fighters and Uncle Chuck, who assemble in an isolated area near one of the huts. Sally Acorn arrives, thanking Sonic the Hedgehog for his work, but Sonic, on the other hand, is wondering why they aren't celebrating with the others. Sally asks him why he thinks they aren't, claiming he isn't as fast as he seems...while a small mechanical bug flies out of her hair unnoticed. Uncle Chuck then walks in on the conversation, thinking Sonic is too tired from fighting Robotnik to think for himself. This all confuses Sonic, as Sally brings out a box. She opens it up and hands it over to him, revealing a medal, citing Sonic for his bravery, courage, and leadership. He puts the medal on, thanking the others for the recognition and the party. After the party, every retires to their huts for a well-deserved night's sleep. Sonic sleeps in his bed, along with his medal, until Sally enters his hut and tries to wake him up. While Sonic recovers from his sleep, NICOLE interrupts, asking Sally if it is such a good idea to wake him up for a secret mission, especially since he appears tired from the party. Sonic overhears NICOLE, so he fully wakes up and asks Sally about the secret mission. Sally tells him to keep quiet and to follow her. They arrive in the middle of the Great Forest, but Sally continues to remain quiet about what exactly the secret mission is. Sonic finally gives in and asks Sally what is up, wondering why she is being so quiet, which is unusual for her. Sally smirks as her eyes turn red. She then turns to Sonic, yelling at him that the secret mission isn't a secret after all, calling him out as a fool. Suddenly, from out of the bushes, a group of combots surround Sonic. They quickly open fire on him, but he is quick enough to dodge their surprise attack. Sally, meanwhile, loses her organic form, revealing a robotic Sally, who dares Sonic to call out for help, and that Dr. Robotnik will claim Knothole. Confused, Sonic runs back toward Knothole to warn the others, wondering why this is all going on with Dr. Robotnik defeated. Sonic, however, doesn't have to run far as Tails enters the scene, grabbing Sonic and flying him into the air. Sonic updates Tails on what is going on, that Sally has been roboticized and that somebody has taken over Robotnik's forces, and are on their way to Knothole. Then, out of nowhere for a split second, a holographic image of Uncle Chuck appears in front of Sonic. The image disappears, as Sonic looks back to see a Buzzer approaching them. It quickly flies into the scene, with a deeply-rooted hated for the hedgehog, aiming its new laser cannons at him. Their troubles get worse as they see a Crabmeat on the ground below. Tails stops over the badnik, his eyes going red as well, telling Sonic that trouble comes in three. He lets go of Sonic, sending him plummeting for the Crabmeat. Cranking the gears in his head, Sonic comes up with an idea. He slams right for the ground, entering into a spindash on the way. The Crabmeat moves out of the way as he hits the ground and digs, maintaining his spindash. Tails, now fully robotic, flies down and looks at the huge crater left by Sonic. While digging through the ground, Sonic contemplates what has happened to his friends, then he sees another holographic vision of Uncle Chuck ahead of him. Thinking it is another trick, he looks away and spindashes through it to continue his tunnel underground. He eventually believes he is near the hot spring, so he starts to dig up. He jumps out from the ground near the hot spring, noticing Bunnie Rabbot sitting near a tree, crying and with a damaged leg, who tells Sonic that everybody has gone crazy. Sonic decides to walk over and help her up, and, despite the damaged leg, she is able to get her weight on it. She then tells him that a holographic image of Uncle Chuck had just recently come up and fired lasers at her, while her eye away from Sonic turns red. Sonic turns suspicious again, asking her how that is possible if he saw a holographic image of Uncle Chuck as well. Sonic yawns, asking her to just cut to the chase if he really is working against her. Her eyes, indeed, turn fully red, and the damage to her leg heals. She then jumps at Sonic and tries to kick him. She misses as he dodges, destroying a large boulder instead. Looking toward the hot spring, Sonic notices a power ring floating to the surface. He grabs it, but it gets stuck to something under the surface. While he struggles to get it out, Bunnie hops back, now fully roboticized, challenging him. Sonic finally gets the ring uncaught, and throws it at Bunnie. The ring surrounds Bunnie and shrinks, constraining her. With Bunnie taken care of, Sonic leaves the area for Knothole. ...arriving in Knothole, surrounded by the roboticized Tails, Bunnie, Sally and Dr. Robotnik with Cluck, along with some Combots aiming their guns at him. Robotnik announces that he has finally captured Knothole, along with Sonic himself, asking him how it feels to have egg on his face. He laughs at his own pun, but Sonic doesn't find it as funny, intent on stopping his evil plans. Robotnik, however, feels that he will not be able to. All the Freedom Fighters have been roboticized and he has collected a whole assortment of power rings that a Combot has in a large bag. He tells Sonic that he has been defeated, demanding that he join him. The Freedom Fighters surround Sonic, constantly urging him to 'join them'. Sonic's mind starts to enter a state of turmoil, not believing that Robotnik has overtaken Knothole while his friends betrayed him. He thinks back to all the adventures he has had with his friends, thinking that this cannot be real, just as another image of Uncle Chuck comes up saying the same thing. He then turns around and notices Dr. Robotnik and the others turning into wireframes and disappearing, while uttering incomprehensible phrases. In his bed, Sonic opens his eyes, noticing he is surrounded by all of his friends, as their normal selves, but that he is connected to a large robotic headset that is connected to Uncle Chuck, who is sitting in a very elaborate computer-controled chair. He instantly gets up, stating he had a weird dream, but wonders what the deal is with the headset he is wearing. Uncle Chuck gets out of the chair, taking off his own headset, telling him that the medal that he had received from Sally was booby-trapped with a virus that sent him into a virtual reality nightmare. He picks up the medal, which is now toasted. Sonic is still confused, but the other Freedom Fighters let him know that, had he succumbed to the dream, he would've been stuck in that state forever. Uncle Chuck had been using the headsets to try to warn him about what was going on. Sonic gets out of the bed, glad that Robotnik hadn't scored a victory from beyond the grave. Uncle Chuck, however, informs him and the others that Robotnik had nothing to do with the virus. They all react in shock, wondering who exactly was the force behind this mysterious virus. For the first time, Sonic is shown to sleep in a car-shaped bed. This bed may be based off of his vehicle, the Cyclone from Sonic Drift. Numerous badniks from Sonic 1 and Sonic 2 reappear in this issue. 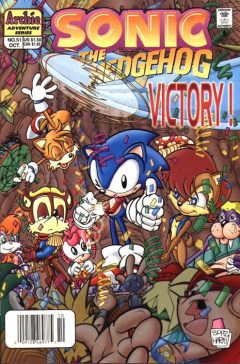 The plot of this issue was initially supposed to mark the beginning of a new long-term story arc, in which it would be revealed that the Sally Sonic revived in the previous issue's ending was a robot duplicate (in turn revealing that it was she who planted the dream device on Sonic in this story), and that the real Sally was indeed dead. It was Sega, however, who decided that she survive. So the arc was abandoned.